Grew Up… with his mother, before being taken away from her (and saved from the slaughterhouse) after being randomly selected for a Guess The Weight competition at a county fair. The farmer Arthur Hoggett guesses correctly, and takes the little piglet home, to the strange new world of his farm. Living… on the Hoggett's farm, trying to make heads or tails of this unusual new home. He's taken under the care of Farmer Hogget and his sheepherding border collie Fly, who looks after him. With farm life comes the threat of death, and Babe is almost killed for dinner during his first Christmas there. Profession… sheepherder. After alerting Farmer Hogget to sheep rustlers, and separating the chickens, Farmer Hoggett gives him a chance to herd his own sheep. With a little nicety and manners, he's able to flock the sheep flawlessly. When asked how he performed the feat, Babe answers simply, “I asked them and they did it. I just asked them nicely." Interests… learning about the various characters of farm life. Naturally inquisitive, Babe is quick to make friends although he does make some enemies, like the cat Dutchess, who at one point reveals to him that humans eat pigs. Relationship Status… none, but he later becomes the surrogate son to the two border collies on the farm, Fly and her mate Rex. Challenge… staying alive. It's no secret that life on a farm for future pork products may be somewhat brief. Animals that don't have a function usually get eaten by humans, some of the animals realize. However, Babe quickly sets himself apart from most swine by being a preternaturally gifted sheepherder. Personality… polite, kind, and brave. When feral dogs attack Hoggett's sheep, he scares them off despite being much smaller and less ferocious. It's clear that this pig has a heart of gold. Babe's popularity ranking on CharacTour is #3558 out of 5,000+ characters. See our top-ranked characters and read their profiles. Babe is a little pig who doesn't quite know his place in the world. 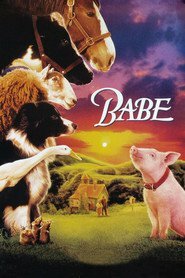 With a bunch of odd friends, like Ferdinand the duck who thinks he is a rooster and Fly the dog he calls mom, Babe realizes that he has the makings to become the greatest sheep pig of all time, and Farmer Hogget knows it. With the help of the sheep dogs Babe learns that a pig can be anything that he wants to be.